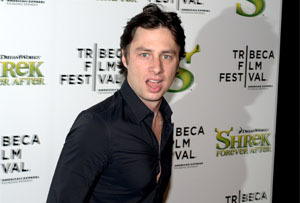 It started life as a fallback for struggling creative types, but crowdfunding has officially gone mainstream: Zach Braff, erstwhile star of early-2000s comedy series Scrubs, has raised $3.1m for his new film project using online service Kickstarter. The comedian tapped 46,000 of his fans for cash to produce Wish I Was Here, a moody-sounding missive on belonging co-written with his brother Adam in which Braff plays a father/actor trying to find his identity. With all the interest the crowdfunding project has generated, Braff has been able to sign up two of Hollywood’s finest to star alongside him: chick flick staple Kate Hudson and Mandy Patinkin, the bearded interrogator-in-chief from Homeland. The publicity from all this can’t have done Kickstarter much harm - but the actor has come under fire from fans who questioned why he didn’t use his own money (he reportedly earned $350,000 an episode for the later seasons of Scrubs) to finance the project. Braff, though, claims this has always been the plan: ‘I have said… in every interview I’ve done on this project that the film would be fully financed from three sources, my Kickstarter backers, my own money [and] pre-selling foreign theatrical distribution,’ he says. Alas, for those who saw Kickstarter as an option for small-time entrepreneurs, it looks like Braff won’t be the only celeb to tap into its potential: he has reportedly introduced Woody Allen to the site. Where big-time Hollywood directors lead, the Z-list tends to follow – so it’s only a matter of time before someone from Made In Chelsea gets involved.